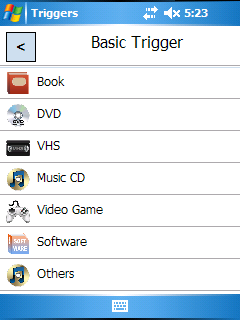 Step 1: Enter the Basic Trigger screen. 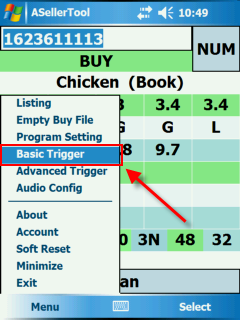 Tap ‘Menu’, followed by ‘Basic Trigger’ (Figure 5). Step 2: Tap the category to edit (Figure 6). Step 3: Choose which offer price to use (Figure 7, Figure 8). Lowest (LA): This will use the lowest price. The offer box will show ‘LA’. This is the default setting. 2nd Used (2U): This will use the second-lowest Used price. The offer box will show ‘2U’. 3rd Used (3U): This will use the third-lowest Used price. The offer box will show ‘3U’. Lowest New (LN): This will use the lowest New price. The offer box will show ‘LN’. 2nd New (2N): This will use the second-lowest New price. The offer box will show ‘2N’. 3rd New (3N): This will use the third-lowest New price. The offer box will show ‘3N’. AVG 3 Used (AU): This will use a calculated average of the three lowest Used prices. The offer box will show ‘AU’. AVG 3 New (AN): This will use a calculated average of all of the three lowest new prices. The offer box will show ‘AN’. *If 3 Used/New prices are not available, the program will average either the lowest 2 Used/New, or simply the lowest Used/New. Lowest FBA (LF): This will use the lowest FBA price. The offer box will show ‘LF’. 2nd FBA (2F): This will use the second-lowest FBA price. The offer box will show ‘2F’. 3rd FBA (3F): This will use the third-lowest FBA price. The offer box will show ‘3F’. 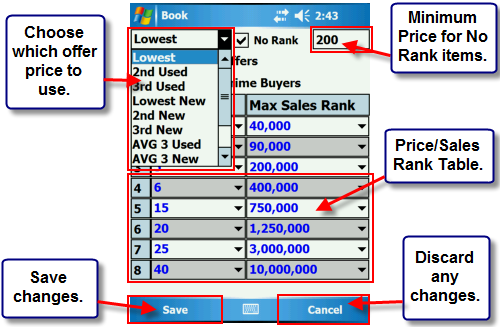 No Rank: When checked, if an item has no sales rank, and the offer price is greater than or equal to the price next to the No Rank checkbox, the item will be a ‘buy’. Ignore FBA Offer: When checked, FBA offers will be excluded from offers being considered for the offer price. 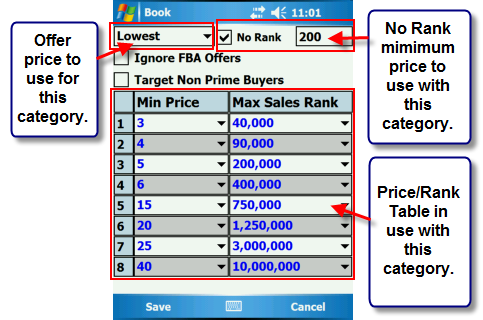 Target Non-Prime Buyers: When checked, FBA offers will not deduct shipping when compared with other non-FBA offers to select the offer price. 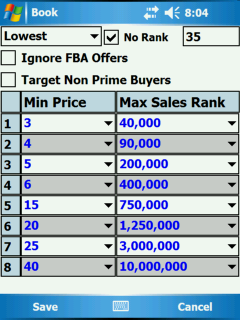 Each row in the table is a trigger comprised of the minimum price, and maximum rank. They can be set by tapping on them, and selecting an appropriate value from the drop down. Save: The save button will save any chances you have made to the criteria. Cancel: The cancel button will discard any changes you have made to the criteria.